CLARKSON WINS E.C.A.C. HOCKEY TITLE IN O.T. ; FIRST IN 12 YEARS! March 22: For the second straight year the Clarkson University Men's Hockey team faced Harvard University in the ECAC Championship Semifinals, but this time the Golden Knights would not need overtime to defeat the Crimson, as the Green and Gold never trailed in a 5-2 victory at the 1980 Herb Brooks Arena. The Golden Knights, ranked ninth in the country in the latest USCHO.com poll, advance to the ECAC Championship game for the second straight year, and will take on Cornell University at 7:30 on Saturday night. Clarkson improved to 25-10-2 on the year, while the Crimson, who will await a possible at-large bid to the NCAA Tournament, fell to 19-10-3. Just like Cornell did in the first semifinal game, the Golden Knights rushed out in front with two goals in the early going. Less than three minutes into the game, the Green and Gold were taking a seemingly harmless draw deep in the Harvard defensive zone when Nico Sturm won the faceoff and flipped it back to Haralds Egle. The junior took little time unleashing a wrist shot over the glove of Harvard goaltender Michael Lackey, going top shelf at the 2:59 mark of the first period. A little over two minutes later, Clarkson capitalized again on a somewhat disconnected Harvard defense. Near the point, Brian Hurley sent a pass down to Jordan Schneider at the left circle where the junior took a wrist shot which was denied by Lackey. The puck slipped out into the slot for Anthony Callin and the freshman forward did not miss, again going over the shoulder of the Harvard netminder at 5:13. Clarkson nearly picked up another goal at the 17:30 mark when a shot trickled through Lackey's pads, with the puck just sitting six inches from the goal line, but the Harvard defense saved its goalie by clearing the puck before he backed into it. The Knights again had multiple chances to start the second period, with Callin taking two shots that were denied by Lackey, including a sprawling save, but the Harvard goaltender's luck ran out later in the period. A back pass from Juho Jokiharju was quickly redirected forward by Aaron Thow to Nick Campoli. The first-year forward made something out of nothing, taking a wrist shot against a one-on-three and finding the back of the net was partially stopped by Lackey but made its way through at the 13:14 mark of the second. What appeared to be a significant momentum shift in Clarkson's direction was silenced just a minute later when the Crimson finally got on the scoreboard. Adam Fox took a wrist shot from the top of the slot, and the puck looked like it was deflected off a Clarkson player, possibly two, and skipped past Jake Kielly at the 14:13 mark. 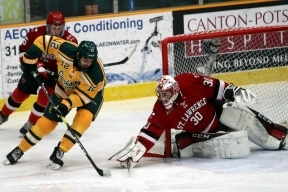 At the start of the third period, the Crimson held on to the puck in the Clarkson defensive zone for a long time and the cycles broke through during a change for the Green and Gold as Fox sent a centering pass from the deep corner out to Jack Rathbone, who wristed in a shot from top of the right circle at 1:13. The Green and Gold did not fold with Harvard starting to put more pressure on the Clarkson defense. In fact, the Knights became opportunistic down the stretch and seemed to pull goals out of soft chances. Midway through the third, Egle centered a pass from the right side boards to Sturm. The junior forward was patient with the puck, bring it all the way into the slot before dropping it off to Jack Jacome, who took a shot which was initially denied by new Harvard goaltender Cameron Gornet. However, Jacome's momentum kept him moving forward and the puck went off his skate, without a kicking motion, and into the net for a deflected goal at 8:08. The same type of score occurred seven minutes later. John Carter MacLean skated into the Harvard zone and waited for Jordan Schneider to emerge in the slot. Schneider patiently waited for his chance, with his wrist shot deflecting off, and breaking the stick, of Harvard's Reilly Walsh. The puck floated over Gornet's head and in at 15:54. Harvard pulled its goalie for the final 3:44, but the Crimson was unable to capitalize with an extra attacker for the rest of the game. Clarkson finished with a 31-28 edge in shots and both teams were scoreless on the power play (Harvard 0-for-2, Clarkson 0-for-1). Kielly finished with 26 saves and Lackey (19) and Gornet (7) combined for 26 as well. March 15: A well-rested Clarkson University Hockey team jumped out to a strong start and held Yale in check for most of the game to open the ECAC Hockey playoffs with a 3-1 victory over the Bulldogs in Game 1 of the their conference quarterfinal series Friday night before 2,112 fans at Cheel Arena. With a victory over Yale in Game 2 of the best-of-three series, Clarkson will advance to Lake Placid next weekend for the conference championship tournament. If the Bulldogs win on Saturday, the teams will meet again at Cheel on Sunday at 7:00 p.m. in a deciding Game 3. Ranked 11th in the national polls, Clarkson extends its current unbeaten streak to six games (4-0-2) and improves to 23-10-2. Yale falls to 15-14-3. Postgame audio Head Coach Casey Jones With a week off because of the first-round bye, Clarkson was ready to go in its first postseason game of the year and was all over Yale through the opening 20 minutes, outshooting the visitors 17-6 en route to 3-0 first-period lead. Freshman Josh Dunne (O'Fallon, MI) started the Knights' off early with his 13th goal of the season. Positioned in front, Dunne tipped in a shot from the top of the slot by sophomore defenseman Connor McCarthy (LaSalle, QUE) for a power-play marker at 4:22. Junior co-captain Devin Brosseau (St. Lambert, QUE) also assisted. A pair of quick strikes later in the period gave the Green and Gold the three-goal cushion. At 13:05, freshmen Nick Campoli (Toronto, ONT) found a loose puck at the side of the net after a couple of shots by linemates, sophomore John Carter MacLean (Basking Ridge, NJ) and freshman Adam Tisdale (Cochrane, ALB), and flipped in his third goal of the season. Forty-three seconds later, senior defenseman Aaron Thow (Toronto, ONT) took a pass from Dunne behind the net and skated around to the bottom of the right circle where he fired in a low shot just inside the far post for his eighth tally of the year. Junior defenseman Greg Moro (Edmonton, ALB) also assisted. Clarkson and Yale both put up seven shots apiece in a scoreless second period. The Bulldogs, who held an 11-3 shot advantage over the final 20 minutes finally got on the scoreboard late in the third period. Defenseman Jack St. Ivany fired in a shot from the top of the right circle that just trickled through the pads of the Knights' junior goaltender Jake Kielly (Eden Prairie, MN) for an unassisted goal at 15:08. Yale pulled goaltender Sam Tucker for the extra attacked with 2:02 remaining, but could not get any closer. Clarkson outshot the Bulldogs 27-24. Kielly finished with 23 saves. The Knights went 1-of-3 on the power play and killed off both of the Bulldogs man-advantage chances. February 15: Joe Deveny scored a pair of goals and Sean David scored the game-winner at 8:55 of the third period to lift the SUNY Canton men's hockey team to a 4-3 win v. Buffalo State on Friday evening. With his 10th win of the season (10-3-2), Michael Cerasuolo now has 13 career victories setting a new program record in the NCAA D-III era. The Roos controlled the opening half of the first period outshooting the Bengals 7-0. Buffalo State got on the board with just two seconds left on the first period clock as Michael Guerrera scored on a knuckler of a shot from near the blue line. Buffalo State doubled its lead just 21 seconds into the middle period when Ryan Edgar had an initial shot that was saved but Jon Colley found Edgar from behind the net out in front to make it 2-0 for the visitors. Canton got on the board at 7:46 of the period when Adam Petric found David Hopfer at the point. His shot went wide left but cycled all the way around the boards to Kyler Matthews near the blue line. He skated in and ripped a slapshot past Trevor Micucci. Four minutes later the Roos knotted the game at two. Kyler Matthews collected the puck in the D zone funneling it behind his own net all the way around the boards where Joe Deveny picked it up. He took on a defender skating behind the Buff State net and wrapped it around just inside the left post for his 34th career goal. Canton took its first lead of the contest at 13:14 of the second on a beautifully executed play. Tyson Bruce and Max Routledge cycled the puck back-and-forth and Bruce hit Routledge below the right circle. He played a quick pass across the face of goal where Deveny buried his second straight goal into an open net. The hosts took a 3-2 lead into second intermission. The Bengals tied the game once again, this time at 3-3, on a short-handed goal from Anthony Tulipane on a breakaway. In a highly entertaining game Canton regained the lead when Sean Shepard hit Tyler Bullard in stride at center ice. Bullard's shot from the right circle went off the left post and right to Sean David at the left circle as he beat Micucci top shelf. Michael Cerasuolo finished with 13 saves in the win, while Micucci turned aside 23 shots in the loss. With the win Cerasuolo sets a new career wins record in the D-III era for the Roos with 13 wins. Luis Puig set the initial mark with 12 victories. February 9: Joe Deveny and Tyson Bruce posted a goal and two assists and Sean David scored the game-winner with 29 seconds left in overtime as the SUNY Canton men's hockey team earned a 5-4 win at Morrisville State on Saturday night. Deveny set the NCAA D-III era program record for career goals with 33 breaking the previous record held by Josh Sova '18. Deveny was one of two Roos to record three points on the night. Tyson Bruce got the scoring started just 1:46 into the contest off the setup from Deveny and Connor Tuttle. Morrisville knotted the game at one at 7:39 of the second period when CJ Stubbs scored shorthanded. Deveny responded two minutes later with a power play goal off passes from Bruce and Kyler Matthews and Jake Mayette gave the Roos a 3-1 lead at 14:40 with helpers from Bruce and Deveny. Stubbs scored his second of the night with 4:33 left in the second as Canton held a 3-2 lead after two. Nick DeVito and Jesse Anderson tallied goals just over three minutes apart early in the third period to take their first lead of the game at 4-3. Routledge beat the opposing goaltender for the third time in his rookie season to tie the game at 4-4 at 5:03 of the third period. Zach Ahola and Luke Hincenbergs were credited with assists on the play. With just 29 ticks left on the clock in overtime David provided the heroics with his third goal in two nights v. the Mustangs and his team-leading ninth goal of the season. Routledge and Hincenbergs earned assists on the game-winning goal. Austin Washkurak made 16 saves in his second straight win, while Sal Stalteri turned aside 25 shots, including four in overtime in the loss. March 8: Three straight Dartmouth goals helped the Big Green edge the St. Lawrence men's hockey team, 3-2, in the first game of a best-of-three ECAC Hockey first-round series at Thompson Arena in Hanover, New Hampshire on Friday night. St. Lawrence got on the board first with Ryan Garvey's sixth of the season, but Dartmouth scored twice in a span of less than five minutes in the latter half of the first period to take a 2-1 lead into the first intermission. 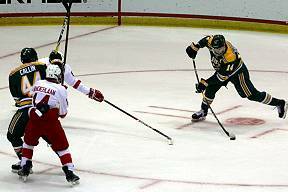 Collin Rutherford extended the Big Green lead to 3-1 at 3:40 of the middle frame with the eventual game winner. Dylan Woolf then concluded the scoring with the second tally of his career, unassisted, to cut the deficit to one near the midway point of the second, but St. Lawrence couldn't net the equalizer. With the loss, the twelfth-seeded Saints fall to 5-28-2 on the season, while fifth-seeded Dartmouth improves to 12-14-4 and has a 1-0 lead in the series. Garvey opened the scoring for the Saints on their first shot of the game, as he finished off a cross-ice feed from classmate Carson Gicewicz on a 3-on-2 rush into the Dartmouth zone. His wrister from the bottom of the left circle beat Dartmouth's Adrian Clark inside the near post for a 1-0 St. Lawrence lead at 6:33 of the opening frame. Less than four minutes later, Dartmouth pulled even when Joey Matthews threw a pass off the end boards to Quin Foreman on the opposite circle, who then fed a quick pass to goal-scorer Drew O'Connor on the far post for a one-timer that beat starter Emil Zetterquist before he could push across into position. At 15:01 of the first, Foreman converted the Big Green's first power-play opportunity of the game to make it 2-1 in favor of the home team. Dartmouth outshot the Saints 19-5 through the opening 20 minutes, and finished with a 36-16 advantage in the game. The Big Green also went 1-for-2 with the man advantage, while St. Lawrence went without a power play on Friday night. Just under four minutes into the second period, Shane Sellar sprung Rutherford and the Big Green on a rush into the Saints' zone and Rutherford ripped a shot from the right wing side that snuck in under the glove of Zetterquist for a 3-1 Dartmouth lead. At 9:45 of the middle frame, after a number of failed clear attempts by the Big Green kept a St. Lawrence possession alive, Woolf picked up the puck on the half wall and skated behind the Dartmouth net before jamming a shot off the inside of Clark's arm for the Saints' second goal. Shots were even at 7-7 in the third period, and the Saints played for more than a minute with an extra attacker at the end of regulation but were unable to cash in and force overtime. Zetterquist finished with 33 saves for the Saints, while Clark stopped 14 for Dartmouth. The Saints will look to keep their season alive and force a decisive game three, as they did last year against the Big Green, with a win on Saturday night. Puck drop for game two is set for 7 p.m. at Thompson Arena. 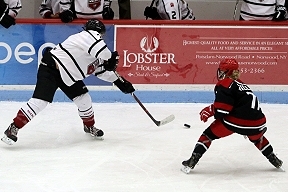 December 8: The St. Lawrence men's hockey team was shut out by No. 16 Clarkson, 3-0, on Saturday night at Cheel Arena in Potsdam, as the teams split the home-and-home series to close out the 2018 schedule. With the loss, the Saints fall to 3-12-1 and 1-4-1 in ECAC Hockey contests, while Clarkson improves to 9-6-0 and 3-3-0 against conference opponents. Junior goaltender Daniel Manella finished with 37 saves, as the Woodbridge, Ontario native made his second consecutive start against the Golden Knights on Saturday. After 37 scoreless minutes, Clarkson's Jere Astren put the home team on the board with his first of the season and the eventual game winner with the teams skating four aside. Astren took a feed from Nico Sturm and beat Mannella with a wrister from the bottom of the right circle high on the glove side at 17:17 to send Clarkson into the second intermission with a 1-0 lead. Clarkson extended its lead to 2-0 midway through the final frame, as Devin Brosseau was able to capitalize on an extremely long shift for the Saints, as they were pinned in the Clarkson zone for two full Golden Knight changes. Brosseau ripped a shot from the slot that went bar down at 10:57 with Nick Campoli and Jack Jacome assisting on the play. Just over two minutes later, Aaron Thow made it 3-0 in favor of the home team as he picked up a turnover at the St. Lawrence blue line and took a quick shot that beat Mannella on the glove side. In the final minute of play, Mannella stopped Clarkson from adding a fourth with a big right pad save from point-blank range even after his stick was pushed into the corner seconds earlier. Cade Gleekel finished with a team-high four shots on goal, while Michael Ederer and Michael Laidley finished with three apiece, but the Saints were outshot 40-15 on the night. Both teams failed to convert with the man-advantage, as the Saints finished 0-for-2 and Clarkson went 0-for-3. November 9: The SUNY Potsdam men's hockey team (3-2, 0-1 SUNYAC) jumped out to a 2-0 lead before the College at Brockport (4-1, 2-1) rallied for a 4-2 victory. Freshman forward Jack Bloem (Saratoga Springs, N.Y./Connecticut Rangers) scored his first collegiate goal for the Bears and freshman forward Devin Panzeca (Lake Zurich, Ill./East Coast Wizards) netted the second goal. Senior assistant captain Nate Skidmore (Syracuse, N.Y./Buffalo Jr. Sabres) made a career-high 39 stops for Potsdam. The Golden Eagles were aggressive out of the gate, pressuring the Bears early, but it was Potsdam striking first. At the 11:01 mark, Bloem banged the puck off Brockport senior goalie Jake Moore (Arcade, N.Y./Springfield Pics) and into the goal for a 1-0 lead. Junior forwards Bryce Ferrell (Buffalo, N.Y./Buffalo Sabres) and Tyler Young (Massena, N.Y./Kanata Lasers) assisted on the goal. Just 1:37 later, Panzeca finished a pass from junior forward Vinny Guimond (Sorel-Tracy, Quebec/Gloucester Rangers) with a high wrist shot to double the advantage. Sophomore defenseman Joseph Richardson (Palm Beach, Fla./PAL Islanders) collected the second assist. The Golden Eagles continued to press, but Skidmore stopped all 16 shots that came his way in the period to preserve the two-goal lead. Brockport exploded for three goals in the second period to grab the advantage for good. Freshman forward Mitchell Parsons (Grandville, Mich./Connecticut Rough Riders) buried a shot in the slot at 3:06 to get the Golden Eagles on the board. Minutes later Brockport went on a 5-on-3 power play. Potsdam managed to kill the first penalty, but couldn't withstand the Eagles pressure on the second. After Skidmore stopped consecutive shots, freshman forward Jake Colosanti (Buffalo, N.Y./Gilmour Academy) jammed home a rebound for a power-play goal at 5:27. Nearly 10 minutes later, freshman forward Jordan Renaud (Rusell, Ontario/Amherst Ramblers) caught a long pass in stride, split two defensemen and beat Skidmore with a high shot. Potsdam's goaltender made 15 more saves in the second period, but the Bears trailed 3-2 after 40 minutes. The teams combined for 12 penalties in the third period and Brockport took advantage of its second 5-on-3 power play to get some insurance. Junior forward Connor Hutchins (North Richland Hills, Texas/Brookings Blizzard) tipped a shot from the left point past Skidmore to make it 4-2 at 8:59. Penalty after penalty upset the flow of the game after the goal and neither team seemed able to add to its total as the contest ended with Brockport's two-goal win. Moore stopped 17 shots for the victory. Brockport outshot the Bears 43-19 and was 2-for-7 on the power play. Potsdam was 0-for-3. 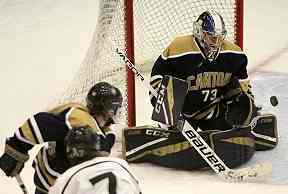 November 2: After SUNY Canton (1-2) rallied from a 2-0 deficit, Bears junior forward Bryce Ferrell (Buffalo, N.Y./Buffalo Jr. Sabres) dashed their hopes with overtime goal to give the SUNY Potsdam men's hockey team (3-1) a 3-2 victory on Friday night. The win was the 100th of head coach Chris Bernard's career. Sophomore forward Jake Juron (Latham, N.Y./South Shore Kings) and senior defenseman Dom Horvath (Toledo, Ohio/Brantford 99ers) also scored for the Bears. Senior assistant captain Nate Skidmore (Syracuse, N.Y./Buffalo Jr. Sabres) made 29 saves for the win. The first period saw no scoring with teams combining for 15 shots. Potsdam and Canton alternated two power plays apiece, but the score was unchanged after 20 minutes. The Bears broke through first at 3:03 of the second period. Sophomore forward Jake Juron (Latham, N.Y./South Shore Kings) jammed home the rebound to finish an odd-man rush to make it 1-0. Junior forward Nate Zweig (Binghamton, N.Y./Syracuse Stars) and sophomore forward Paul Michura (Chester, N.J./New Jersey Rockets) assisted on the goal. Senior defenseman Dom Horvath (Toledo, Ohio/Brantford 99ers) doubled lead at 7:30 with a shot in the slot after a Canton turnover. Freshman forward Devin Panzeca (Lake Zurich, Ill./East Coast Wizards) and junior assistant captain Vincent Guimond (Sorel-Tracy, Quebec/Gloucester Rangers) recorded the assists. The Roos countered 1:41 later as Adam Petric cut the lead in half. The Bears outshot Canton 12-9 in the middle period and held onto the one-goal lead. The Roos ramped up their play in the final period, outshooting Potsdam 14-6. The effort paid off as Joe Deveny tied the game at 7:04. The scored remained even as regulation ended. Just 1:37 into overtime, freshman forward Jack Bloem (Saratoga Springs, N.Y./Connecticut Rangers) forced a turnover at the Canton blue line. Junior forward Tyler Young (Massena, N.Y./Kanata Lasers) picked up the puck and fed Ferrell at the right side of net to close out the game. Kangaroos goalie Austin Washkurak finished with 24 saves. Canton edged Potsdam in shots, 31-27. The Bears were 0-for-5 on the man advantage and held the Roos scoreless on three chances. 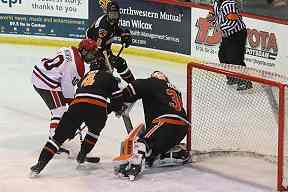 November 9: The Plattsburgh State men's ice hockey team held on despite a late charge by No. 2/2 SUNY Geneseo, upending the defending State University of New York Athletic Conference (SUNYAC) champion Knights, 3-2, in conference action at the Ronald B. Stafford Ice Arena Friday evening. Geneseo is ranked at No. 2 in both the USCHO.com Men's Division III Top-15 Poll and the D3hockey.com Men's Top-15 Poll. The Knights pulled their goalie on a pair of power-play opportunities late in the third period, and it paid off on both occasions, scoring with the 6-on-4 advantage at 16:16 and 16:49 of the third period. Geneseo was unable to produce the equalizer, however, and the Cardinals escaped with the victory. Both teams' power-play units performed well, with the Cardinals going 2-for-3 on the power play and the Knights going 2-for-5. Geneseo lost despite finishing with a 40-25 edge in shots on goal. Plattsburgh State remains unbeaten with the win, rising to 3-0-0 overall (3-0-0 SUNYAC). The Cardinals will look to complete the weekend sweep tomorrow when they host The College at Brockport at 7 p.m. Geneseo slips to 3-1-1 overall (1-1-1 SUNYAC) with the loss and next visits SUNY Potsdam tomorrow night at 7 p.m. Senior forward Cam Owens (Wilmington, Mass./Islanders Hockey Club) put the Cardinals on the board at 11:32 of the first period. Senior forward Ross Sloan (Oakville, Ontario/Oakville Blades) sprung Owens forward with a stretch pass into the neutral zone, and Owens led an odd-man rush into the Geneseo zone. He dropped the puck off to sophomore forward Rich McCartney (Hershey, Pa./Philadelphia Revolution) in the slot, and McCartney took a shot that was turned aside by the Knight netminder. Owens then banged home the rebound just outside the crease to stake the Cardinals to a 1-0 lead. With Geneseo sustaining a five-minute major, Plattsburgh State took advantage, as senior forward Pat Egan (Rochester, N.Y./Lone Star Brahmas) buried a power-play goal for his first of the season at 5:18 of the second period. Freshman defenseman Matt Araujo (Brookhaven, N.Y./Boston Jr. Rangers) fed freshman forward Christian DiFelice (Thorold, Ontario/Buffalo Jr. Sabres) from the point, and DiFelice centered a pass to Egan in the slot from the left face-off circle. Egan ripped a shot that beat the Geneseo goalie top shelf glove side to give the Cardinals a 2-0 advantage. Senior forward Cole Stallard (Atlanta, Ga./New Hampshire Jr. Monarchs) scored on the power play with 15:04 elapsed in the third period to hand Plattsburgh State a 3-0 cushion. With Geneseo trying to clear the zone, Araujo kept the Cardinals onside by batting the puck down with his arm just inside the blue line, and he zipped a pass from the left point down to Stallard in the right circle. Stallard one-timed the puck into the back of the net, beating the Knight goaltender glove side. Geneseo began to make things interesting following a roughing penalty assessed to Plattsburgh State at 15:12 of the third period. The Knights started the power play by pulling their goalie in favor of the extra attacker, and the decision paid off, as junior forward David Szmyd scored a 6-on-4 power-play goal amongst traffic in the slot with 16:16 gone in the third. Junior forwards Conlan Keenan and Andrew Romano earned assists on the play. The Cardinals took on another minor penalty following the goal, putting the Knights back on the power play with the neutral-zone face-off forthcoming. Geneseo pulled its goalie just before a stoppage with 16:34 elapsed in the third and decided to use its timeout. Junior forward Tyson Empey drew the Knights within one with another 6-on-4 power-play goal, scoring on a tight angle to the right of the goal along the goal line following a D-to-D pass from senior defenseman Mitch Ferguson to junior defenseman Duggie Lagrone that set up Empey's marker. Geneseo twice pulled its goalie in the final 30 seconds of play, but the Knights were unable to net the game-tying goal with the extra skater on the ice. Sophomore goaltender Jimmy Poreda (Tonawanda, N.Y./Connecticut Jr. Rangers) stood on his head with a 38-save performance in the win, with the lone goals he allowed coming on a 6-on-4 advantage for Geneseo. Senior goaltender Devin McDonald made 22 saves in the loss for Geneseo. November 3: Sophomore goaltender Jimmy Poreda (Tonawanda, N.Y./Connecticut Jr. Rangers) posted his fourth career shutout with a 21-save effort, as the Plattsburgh State men's ice hockey team blanked Morrisville State College, 3-0, Saturday evening at the IcePlex to complete a State University of New York Athletic Conference (SUNYAC) series sweep over the Mustangs. The Cardinals finished with a 37-21 edge in shots on goal. Both teams were scoreless on the power play, as Plattsburgh State was 0-for-5 with the extra skater, while Morrisville was 0-for-6. Plattsburgh State rises to 2-0-0 overall (2-0-0 SUNYAC) with the win and next hosts defending SUNYAC champion SUNY Geneseo on Rock the Red Night—which also serves as the team's regular-season home opener—on Friday, Nov. 9, at 7 p.m. Morrisville drops to 0-4-0 overall (0-2-0 SUNYAC) with the loss and next hosts SUNY Cortland on Friday, Nov. 9, at 7 p.m. Sophomore forward Tom Bowe (Homer, Alaska/Aspen Leafs) scored his first collegiate goal 5:05 into the contest, one-timing a pass from sophomore forward Mike Falanga (East Haven, Conn./Islanders Hockey Club). Sophomore forward Rich McCartney (Hershey, Pa./Philadelphia Revolution) netted his third goal of the young season with 15:32 elapsed in the first, beating the Mustang goaltender with a shot that went over his pad. Senior forward Cam Owens (Wilmington, Mass./Islanders Hockey Club) and junior forward Joe Drabin (Rochester, N.Y./Wenatchee Wild) earned assists on McCartney's goal. Plattsburgh State added insurance with a goal by senior forward Cole Stallard (Atlanta, Ga./New Hampshire Jr. Monarchs) 14:30 into the second period, as Stallard tipped in a feed from freshman forward Daniil Ovchinnikov (Saint Petersburg, Russia/Boston Jr. Rangers). Sophomore forward Greg Malafronte (Colts Neck, N.J./New Jersey Titans) also earned an assist on the play. The Cardinal penalty kill clamped down in the third period and weathered three penalties, including a stretch of 39 seconds of a 5-on-3 power play for Morrisville. 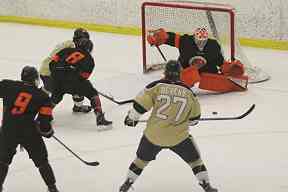 Morrisville's freshman goaltender Jorgen Johnson shouldered the loss, making 34 saves. March 22: An amazing postseason run came to a close for Clarkson University Women's Hockey as the Golden Knights lost to Wisconsin in the Frozen Four semifinals held at the People's United Center on the campus of Quinnipiac University in Hamden, CT on Friday night. Champions of the past two NCAA Tournaments, Clarkson entered the 2019 Frozen Four with a string of 19 consecutive playoff wins, including seven straight NCAA postseason victories. The Knights, who made their fourth consecutive showing in the Frozen Four, finished the 2018-19 campaign with a 30-8-2 record. Clarkson's senior class ended its stellar four-year career with 128 victories and two National Championships (2017, 2018). Wisconsin, Clarkson postgame press conferences Wisconsin, which lost the national title game to the Green and Gold in 2017, controlled the majority of this year' semifinal match up en route to the 5-0 victory. The Badgers outshot Clarkson 40-14. Wisconsin's shorthanded units excelled, killing off all four of the Knights' man-advantage chances, helping the Badgers hand Clarkson its first shutout of the season. Wisconsin, benefiting from a power-play opportunity in the first period, outshot the Golden Knights 13-5 through the opening 20 minutes, but it was the Knights who had the two best opportunities to get on the scoreboard first. The top two scorers in the nation had excellent chances to give the Green and Gold the early lead, but could not connect. Senior left wing Loren Gabel (Kitchener, ONT), a Top 3 Finalist for the Patty Kazmaier Award, had a 2-on-1 chance with linemate, sophomore right wing Elizabeth Giguere (Quebec City, QUE), but her rising wrist shot from the right circle was gloved by Badger goalie Kristen Campbell at 7:15. Shortly after Clarkson killed off the Wisconsin power play, Giguere attempted to lift in a backhand from in close, but was denied by Campbell with three minutes remaining in the stanza. Wisconsin outshot the Knights again in the middle frame and finally got one past Clarkson goaltender Kassidy Sauve (Whitby, ONT) at 9:29 with a goal by Abby Roque on a shot from the slot. Clarkson could not convert on its three power-play opportunities in the stanza. The Badgers scored four times over the final 10 minutes of the third to pull away for the win, and the opportunity to face WCHA rival Minnesota in Sunday's National Championship game. 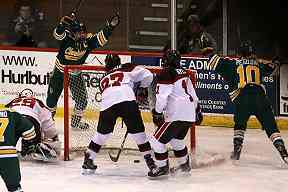 At 13:47, a pass by Sam Cogan from behind the Clarkson net bounced off a Golden Knight defender in front to give Wisconsin a two-goal lead. The Badgers' leading scorer Annie Pankowski scored twice to seal the win, connecting at 13:37 and again with an empty-net tally at 18:40. Norby Presley closed out the scoring with 55 seconds remaining. Sauve finished with a 35 saves. 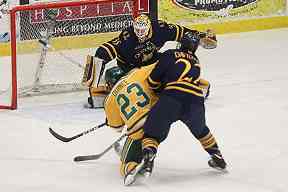 March 16: It is back to the Frozen Four for the two-time defending National Champion Clarkson University after a thrilling 2-1 overtime victory against Boston College in NCAA quarterfinal action at Cheel Arena on Saturday afternoon. The Golden Knights, who played in three extra-session games in last year's run to their third NCAA Title, got the game-winner from a familiar source to win their 19 straight game in the postseason. Sophomore Elizabeth Giguere (Quebec City, QUE) found a loose puck at the top of the crease during a scramble in front and knocked in the winner at 14:38 of overtime. Giguere tallied the gamewinner in overtime of last year's National Championship game 2-1 victory over Colgate. She also scored the deciding goal in the extra session of last year's 2-1 triumph over Mercyhurst in the 2018 national quarterfinal at Cheel. Giguere, who has 11 game-winners in her brief collegiate career, also tallied the overtime-winning goal in the 4-3 Game 2 victory over Quinnipiac in the ECAC Hockey quarterfinals on March 2. Giguere's goal against Boston College was set up by assists from junior center Michaela Pejzlova (Pardubice, Czech Rep.) and senior defenseman Emma Keenan (Calgary, ALB). Trailing 1-0 late in the third, Clarkson tied the game on a great individual rush by senior defenseman Josiane Pozzebon (Bourget, ONT). Pozzebon took a pass from senior Cassidy Vinkle (Belleville, ONT) at the BC blueline and skated around a couple of Eagle defenders, cut to the net and flipped in her sixth goal of the season with 3:03 remaining in regulation. Boston College got the early jumped with a goal from last year's Patty Kazmaier winner Daryl Watts, who redirected a shot from the top of the right circle at 13:24 for her 22nd goal of the season. Boston College outshot the Green and Gold 36-30, but graduate student Kassidy Sauve (Whitby, ONT) was on top of her game, making 35 saves, including six in overtime. Clarkson was 0-of-3 on the power play, while Boston College went scoreless on its lone man-advantage of the game. Unbeaten in its last eight games (7-0-1), the Knights have reached 30 wins for the fourth consecutive season. 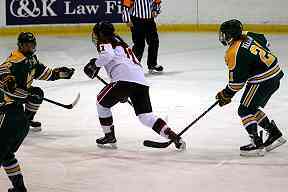 December 8: St. Lawrence University senior forward Rachael Smith scored the first goal of the game, but fifth-ranked Clarkson scored the next three goals to defeat the Saints' women's hockey team 3-1 in an ECAC Hockey contest at Cheel Arena in Potsdam on Saturday afternoon. The loss was the fourth in a row for the Saints, and the second straight against the Golden Knights; Clarkson defeated St. Lawrence 4-0 at Appleton Arena on Friday. "Today's game was a lot like yesterday's game," said St. Lawrence head coach Chris Wells '92. "We had a pile of chances and we just didn't score many goals. It was nice to get out to a 1-0 lead early, and I thought we played great in the second and third periods. We created a lot of chances and put pressure on them. Both goalies made highlight-reel saves and we just couldn't finish. It's a good time to go on break." Smith gave the Saints a 1-0 lead less than six minutes into the game, creating a breakaway by stealing the puck at her own blue line and tucking the puck into the lower left side of the net for her team-best eighth goal of the season. Elizabeth Giguere tied the game for Clarkson, redirecting a feed from Loren Gable into the top right corner of the net. Smith had a chance to give the Saints a 2-1 lead with a look at a wide open net on a rebound, but the puck bounced over her stick. Just moments later, the Golden Knights took a 2-1 lead, as Morgan Helgeson buried a loose puck after Kristy Pidgeon's tough-angle shot went off the side of the net and the puck slid right into the slot. The Golden Knights took a 3-1 lead on a power play goal early in the second period, with T.T. Cianfarano finishing a tic-tac-toe passing play after an offensive zone faceoff with a hard shot from the slot. The goal was just the second power play goal given up by the Saints this season and snapped a run of 11 straight games without giving up a power play goal. Justine Reyes had a great opportunity for the Saints later in the second period, collecting a loose puck in the slot and firing a wrist shot towards the top right corner, but Clarkson goaltender Kassidy Sauve snagged it in her glove to preserve the two-goal lead. After getting outshot 15-5 in the first period, the Saints had a 22-15 advantage in shots on goal in the second and third periods. Sauve made 26 saves for the Golden Knights, while Sonjia Shelly made 27 saves for St. Lawrence. St. Lawrence, now 9-10-1 overall, 4-4-0 in ECAC Hockey, have five weeks off before their next game, when they will go on the road to face Union and Rensselaer. Clarkson improved to 14-4-0, 5-3-0. December 7: The fifth-ranked Clarkson University women's hockey team scored three goals in two minutes and 19 seconds early in the second period to take control of the game, and St. Lawrence University was unable to mount a comeback as the Golden Knights defeated the Saints 4-0 in an ECAC Hockey contest at Appleton Arena on Friday afternoon. Kassidy Sauve made 21 saves to record the shutout for the Golden Knights. Between the second and third periods, former St. Lawrence women's hockey coach Paul Flanagan '80 P'13 was recognized as part of the Legends of Appleton ceremonies taking place this weekend. "There was a lot of energy in the building with everyone back for Legends weekend and unfortunately we couldn't set the siren to create a little more," said St. Lawrence head coach Chris Wells '92. "Sauve made some big saves and we hit three pipes. It would have been nice to see where the game would have gone if we had scored the one midway through the second on the power play. Our team battled all night to score. Fortunately we have another opportunity to play tomorrow." Elizabeth Giguere got the Golden Knights rolling, backhanding a pass across the crease from Kelly Mariani into the net three and a half minutes into the second period for the first goal of the game. Cassidy Vinkle increased the lead to two just 19 seconds later, with Michaela Pejzlova feeding Vinkle from the right side on an odd-man rush. Kristy Pidgeon scored exactly two minutes later, lifting a shot from a tough angle over St. Lawrence goaltender Grace Harrison's shoulder into the top shelf. Tia Stoddard added an empty-net goal with eight minutes to play for the Golden Knights. St. Lawrence was scoreless on five power play opportunities, but had several great scoring chances on the power play, including shots off the post by Lydia Grauer and Rachael Smith. The Saints held the Golden Knights scoreless in their lone power play opportunity, improving their nation's best penalty kill to 32-for-33 on the season (97.0%). Harrison made 25 saves for the Saints. Clarkson, which improved to 13-4-0, 4-3-0 in ECAC Hockey, held a 29-21 edge in shots on goal. St. Lawrence fell to 9-9-1, 4-3-0. November 16: The second ranked Plattsburgh State Cardinals (4-0, 3-0 NEWHL) defeated the SUNY Potsdam women's hockey team (3-3-1, 2-2-1 NEWHL) 5-0 on Friday night. Bears junior goalie Alexa Pfeiffer (Sylvania, Ohio/Little Caesar's) made 31 saves. Plattsburgh controlled the play in the first period, outshooting Potsdam 17-4. Sophomore forward Annie Katonka (Pittsburgh, Pa./Pittsburgh Pens Elite) tipped a shot from the point past Pfeiffer to open the scoring at 9:34. Nearly seven minutes later, sophomore forward Kaitlin Drew-Mead (Niagara Falls, N.Y./Buffalo Bisons) scored a similar goal to make it 2-0. The teams headed into the intermission with the score unchanged. Thanks in part to three power plays in the second period, Potsdam fired 15 shots on Cardinals senior goalie Kassi Abbott (Medford, Mass./Boston Shamrocks Elite). However, the goaltender stopped each one and Plattsburgh added another goal. At 7:59, freshman forward Sara Krauseneck (Saginaw, Mich./Northern Cyclones) finished a two-on-one with a wrist shot that made it 3-0. The third period saw plenty of penalties and back-and-forth play, but two Plattsburgh goals in a 1:24 span put the game away. Sophomore forward Abby Brush (Mount Prospect, Ill./Chicago Young Americans) poked home a shot in the slot to make it 4-0 at 12:11. At 13:35, freshman defenseman Hanna Rose (Chaumont, N.Y./Northwood School) scored a power-play goal on a high shot from the left point to close the scoring at 5-0. Abbott made 27 saves and still hasn't allowed a goal this season. Plattsburgh outshot Potsdam 36-27 and was 1-for-4 on the man advantage. The Bears were 0-for-7. The two teams go at it again tomorrow night at 7 p.m. in Plattsburgh. 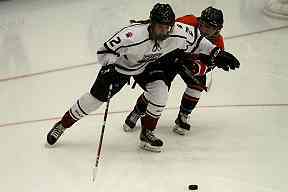 November 2: The SUNY Potsdam women's hockey team (2-1) downed the Buffalo State Bengals (1-1-1) 6-1 on Friday night in the team's NEWHL opener. Potsdam took control of the contest early with great passing and their disruptive defense. Sophomore forward Natalie Wasielewski (Carnegie, Pa./Pittsburgh Penguins Elite) recorded a hat trick. Junior defenseman Delphine Léonard (Anjou, Quebec/Dawson College Prep) had a goal and an assist and sophomore forward Alexis Clark (Niagara Falls, N.Y./Buffalo Bisons) and junior forward Miranda Kolb (Watertown, N.Y./SUNY Cortland) netted the other two goals for the Bears. After the period opened evenly, Potsdam jumped out in front on a shorthanded goal from Wasielewski at 7:53. Sophomore goalie of the Bengals Bri Gawronski (Dunkirk, N.Y./Buffalo Bisons) couldn't react to the speed of the Bears offense in transition and Wasielewski capitalized with a high shot. At the 14:00 mark, the Bears took advantage of their second power play of the night and extended their lead to 2-0. After the faceoff, the Bears' passing kept the Bengals on their heels. Gawronski made a diving stop on one shot, but Kolb stayed with the play and scored while the goalie was down. Junior forward Lucy Condon (Waterloo, Ontario/Waterloo Ravens) assisted on the goal. The score was unchanged at the first intermission. Buffalo State cut the lead with its own shorthanded goal just 17 seconds into the second period. After a turnover by Potsdam in the offensive zone, senior forward Emma Ruggiero (Amherst, N.Y./Buffalo Regals) picked up a pass from junior forward Lila Toczek (North Tonawanda, N.Y./Niagara Jr. Purple Eagles) and went the length of the ice uncontested. Potsdam answered shortly after with two goals. First, Clark went through two defenders and loaded up her shot as she went around a third before depositing the puck just under the crossbar. The second goal came after Wasielewski intercepted a pass from Buffalo, split through the defense and buried her second goal of the night from the left circle. Despite being outshot 9-6 in the middle 20 minutes, the Bears had increased their lead to 4-1. Léonard pushed the lead to 5-1 at 11:08 of the third after a she took a pass from sophomore forward Allie Banas (Buffalo, N.Y./Buffalo Bisons) and weaved all the way down the ice before scoring from the right side. Wasielewski scored her third goal of the night after Condon gained control of the puck and dished it to her. She finished the play with a bullet from the right circle. The goal gave the Bears a 6-1 lead and closed out the win. Junior goalie Alexa Pfeiffer (Sylvania, Ohio/Little Caesar's) stopped 24 shots for the 15th victory of her career. She is now tied for second place on the program's wins list. Gawronski made 19 saves for the visitors. November 27: Lily Cullen scored her first collegiate goal to give the Roos the lead in the third period but SUNY Potsdam responded with a power play goal as SUNY Canton and the Bears skated to a 1-1 overtime tie. Neither team found the back of the net in the first 40 minutes as Canton outshot Potsdam 17-13 during that span. Jessica Pele had a great opportunity with less than a minute left in the middle period as her shot on a 2-on-1 rang off the right post. Cullen scored her first collegiate goal, unassisted, at 1:15 of the third period as she beat Bears goaltender Alexa Pfeiffer low blocker side for the lead. Miranda Kolb drew the Bears even at 8:38 of the third on the power play when Delphine Leonard fed the puck left to right and Kolb finished past the blocker of Brooke Susac. Ellie Cleary also earned a helper on the play. Susac made 22 saves for the Roos, while Pfeiffer turned aside 26 shots for the Bears. The Roos open a weekend road series at Wilkes University when they square off with the Colonels on Friday at 5 p.m.
November 10: Kelly Ferreira scored a pair of second period goals to lift visiting Nichols College to a 3-1 win and a weekend split v. the SUNY Canton women's hockey team on Saturday afternoon. The Roos (2-3-1, 2-2-0) got on the board first with just less than 30 seconds remaining in the first period. Breanna Bedborough's initial shot was saved by Bison goaltender Cassandra Goyette but Ashley Gillies put home the rebound at the far post. Canton held a 1-0 lead on the scoreboard and 10-7 shots advantage in the opening period. The Bison (4-2-0, 2-2-0) responded with three goals in the second period as Mel McAleer got the scoring started on her fifth goal of the season at 5:52. Kelly Ferreira tallied a pair of goals eight minutes apart with the first coming on the power play to give the visitors a 3-1 lead after two. Goyette stopped all seven shots she faced in the final period to stifle a comeback. Brooke Susac made 24 saves in the game for the Roos, while Goyette turned aside 23 shots. November 16: The No. 2 Plattsburgh State women's ice hockey team posted its fourth consecutive shutout to start the 2018-19 season, as the Cardinals cruised to a 5-0 Northeast Women's Hockey League (NEWHL) win over SUNY Potsdam on Friday evening at the Maxcy Ice Arena. Plattsburgh State is ranked at No. 2 in both the USCHO.com Women's Division III Top-10 Poll and the D3hockey.com Women's Top-10 Poll. The Cardinals finished with a 36-27 edge in shots on goal in addition to going 1-for-4 on the power play. The Bears were scoreless in seven chances with the extra skater. Plattsburgh State rises to 4-0-0 overall (3-0-0 NEWHL) with the win, while Potsdam drops to 3-3-1 overall (2-2-1 NEWHL) with the loss. The two teams will wrap up the weekend series tomorrow evening at 7 p.m. at the Ronald B. Stafford Ice Arena in Plattsburgh, N.Y. Sophomore forward Annie Katonka (Pittsburgh, Pa./Pittsburgh Pens Elite) put the Cardinals on the board 9:34 into the first period, tipping a shot that junior defenseman Hannah Kiraly (Glendale, Ariz./Northern Cyclones) took from the point past the Bear goaltender. Sophomore defenseman Emma Killeen (Watertown, Conn./The Gunnery) also earned an assist on the play. With 16:30 gone in the first, sophomore forward Kaitlin Drew-Mead (Niagara Falls, N.Y./Buffalo Bisons) made it a 2-0 game. Senior forward Mackenzie Millen (Anchorage, Alaska/North American Hockey Academy) took control of a loose puck along the end boards and skated behind the back of the goal from left to right before wrapping the puck around the right post. Potsdam's junior goaltender Alexa Pfeiffer made a pad save, but Drew-Mead poked in the rebound. Freshman forward Sara Krauseneck (Saginaw, Mich./Northern Cyclones) scored her first collegiate goal with 7:59 elapsed in the second period. Killeen sent a stretch pass forward to Kiraly, and Kiraly centered a pass into the slot to Krauseneck from the right face-off circle. Krauseneck then one-timed a shot past the Bear goalie blocker side to give the Cardinals a 3-0 advantage. Plattsburgh State took a 4-0 lead with 12:11 gone in the third, as sophomore forward Abby Brush (Mount Prospect, Ill./Chicago Young Americans) backhanded a shot five-hole right outside the crease thanks to a feed from Katonka that came from behind the goal line. Finally, 1:24 later, the Cardinals scored on the power play to round out scoring in the contest. Millen passed D-to-D to freshman defenseman Sierra Benjamin (Palm Coast, Fla./Northwood School), and Benjamin found freshman defenseman Hanna Rose (Chaumont, N.Y./Northwood School) undefended in the high slot just inside the blue line. Rose ripped a slap shot past the traffic in the slot that wound up sailing over the goalie's shoulder blocker side and into the back of the net. Senior goaltender Kassi Abbott (Medford, Mass./Boston Shamrocks Elite), who is tied for the NCAA Division III lead in save percentage (1.000), goals-against average (0.00), winning percentage (1.000) and shutouts (4), made 27 saves in the shutout victory. With the shutout, Abbott now has 13 for her career, which moves her into a tie for sixth in the program's career record book with Bree Doyle (2004-07). Potsdam's Pfeiffer turned aside 31 shots in the loss.